Only, as it turned out, Goodman wasn't built for college basketball. In September 1999 he reneged on an oral commitment to Maryland when he felt the school was lukewarm about his playing ability. He ended up at Towson, where any doubts the Terps might have had about him were borne out As a freshman Goodman scored 6.0 points a game, and last year he played in just seven games, averaging 1.9 points and 2.3 turnovers. His playing days at Towson ended after he accused his coach, Michael Hunt, of brandishing a chair at him in the locker room. After staging a return to the spotlight in 2007 to capitalize on his high school and college fame, Tamir Goodman has been running basketball camps, putting on clinics, and doing speaking engagements. Now he is turning into a businessman as well. As any Orthodox Jewish basketball player will tell you, it's not easy running up and down the court with four woven sets of strings dangling from the four corners of your undergarment. The photos of Tamir hooping it up with a yarmulke on his head and his tzitzit flying through the air as he leaped for a layup became famous and were sources of pride in the observant Jewish community. 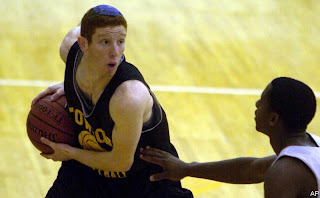 However, it was not comfortable for ballers like Tamir to wear mesh tzitzit under his jersey. At OK Kosher Certification's 13th annual international Mashgiach Conference held Monday, Tamir introduced the "Sport Strings Tzitzit." He described it as revolutionary tzitzis garment that features hi-performance properties and a compression fit - offering the wearer ultimate comfort and style for sports and everyday wear. Tamir was joined at the conference in Chovevei Torah in Crown Heights by a friend who also embodies the notion that being religious does not interfere with his career: boxing champion Dmitriy Salita. While Salita did not say if he wears the "Sport String Tzitzit" himself, Tamir made it clear that anyone would enjoy wearing them for their UV protection, moisture wicking and anti-odor features. Goodman's tzitzit are certified kosher by the OK Kosher certification agency. No word yet on whether NBA star Amare Stoudemire will be wearing the Sport Strings Tzitzit. Whether anyone wears or doesn't wear the Sport Strings Tzitzit, we should go by the Hebrew saying which says that we shouldn't check one's tzitziot, and you know what that means. It was I not exactly anonymous who posted it. This product has a whole litany of fabric features, but what about the tzitzit? Are they machine-spun or hand-spun? for them for an entire season. 1. Are they really kosher? 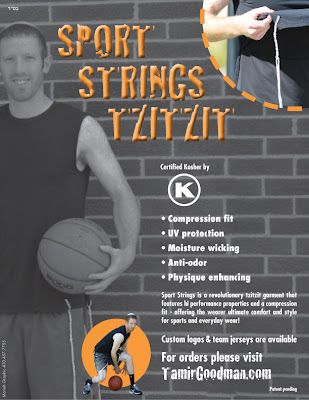 Because some authorities claim tamir goodman's sport strings tzitzit aren't kosher. 2. The strings are machine spun or hand spun?